saw Dietrich’s brother, Chris, marry Maria DIRKS on Nov, 26, 1889. Maria gave birth to their first American cousin, Louise HUMBKE on April 13, 1890. 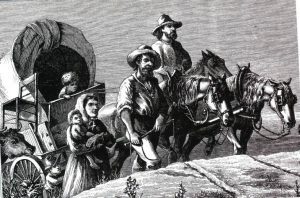 The family (now 8) moved by wagon, herding their animals 252 miles directly East to Buffalo Center, Iowa and then another 15 miles South. 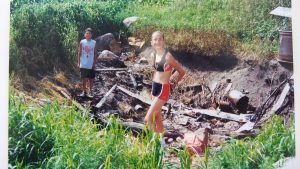 Their new home was 80 acres of the SW Quarter of Section 32, Township 9, North of Range 26, West of the 5th Meridian in Winnebago County, Iowa. 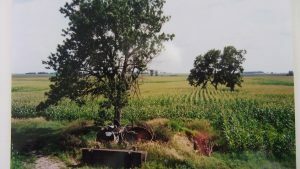 1999 photo of original tree that grew next to the HUMBKE home in Titonka/Woden are of Iowa. Site of HUMBKE Farm Home in Iowa in 1999. Today (2016) only continuous fields of corn and other crops remain. It is easy to goggle the Farm’s location; the Lutheran Church and Cemetery; Woden; and Titonka. In July of 1999, I finally found the German Lutheran cemetery where my great grand father Dietrich HUMBKE was buried. I arrived the day after the congregation and community had celebrated the 100th anniversary of the building of the German Evangelical Lutheran Immanuel Church. We were warmly welcomed by the Minister as the first descendants (of the HUMBKE family that had left 98 years ago) to return to visit the church cemetery. 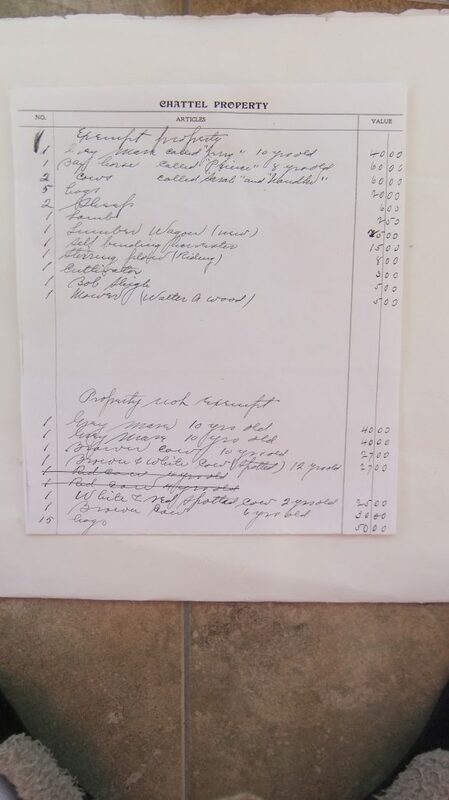 A Mrs. Roger (Neoma) BOYKEN and Debra BOYKEN provided me with the following information which describes life as it was experience by the HUMBKEs from 1892 to 1902 in Iowa. DESCRIPTION OF LIFE EXPERIENCED BY THE HUMBKE FAMILY IN IOWA FROM 1892 TO 1902. “Sometimes when the summer’s hot, dry days came, water was hauled from as far away as seven miles”. The photos were taken in July of 1999. If you goggle the location you can clearly see the Church and Cemetery, but there is no longer any trace of where the Humbke family home and buildings were. There was much more rain at their new home (to the extent that hoof root of cows was common), but it also resulted in great crops, more prosperous time and some money could be saved.. 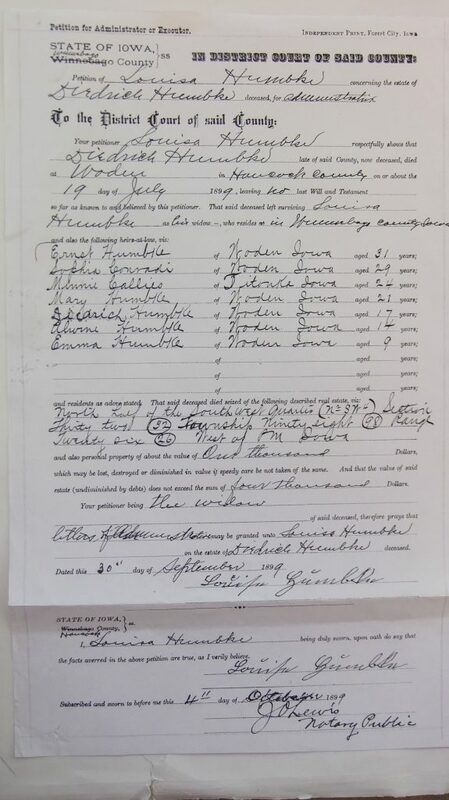 The marriage of Sophie, the oldest daugher of 21 years, to a good German farm boy, Henrich Conrad Conradi, on Sept. 25, 1891 had resulted in her moving to Wellsburg, Iowa (115 miles SE of Titonka, Iowa). The whole community, young and old, enjoyed wedding dances. In 1898 Minnie, the second oldest daughter, marries at age 21 in Woden on Jan. 19, 1998 to 25 year old Titonka German store owner, Charles (Carl) Ludwig Callies. Musical skills run strong in the Humbke blood line and there were surely robust wedding dances for both girls. There would be the best of food and beer at a celebration where great fun was had by all. 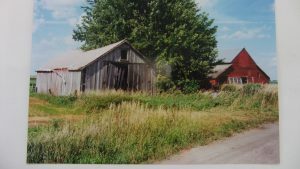 As a young man man growing up in the 1950’s in a rural Wetaskiwin the height of enjoyment was attending a Saturday night dance at a rural dance hall. 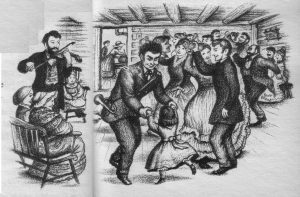 Every small village had a dance hall. It was where most courting took place and one could hardly wait for the “Supper Waltz”! 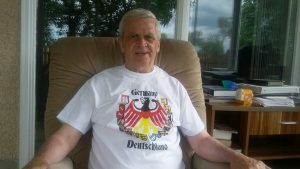 The Humbke family members were devoted German Lutherans and regular church goers. 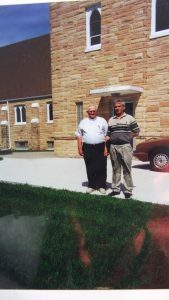 They had to travel 5 miles straight West to the closest Lutheran Church in German Valley for their first 8 years in Iowa. Man on far right with hands crossed is Ernest Sr.; to the left of him is his dad, Dietrich; and next to him is Sophia’s husband, Heinrich Conradi. A picture of the planned church is used as a background. 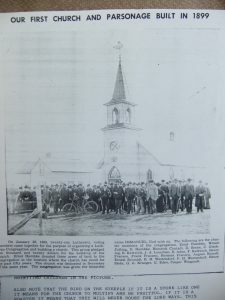 On January 3o, 1899 twenty one charter members (including Dietrich Humbke, his son Ernst Sr. age 32, and his son-in-law Henrick Conradi age 30) plus 100+ supporters pledged $1,020 to build a local church. In 1899 just as everything seems to be going well for the Humbke family- (a church was being built, 2 daughters were happily married, and Ernest Sr. has been able to purchase 3 different local farms immediately South and East of the church) – tragedy struck. While hauling logs for the new church 53 year old Dietrich Humbke had a run-a-way with his horses. Dietrich fell off the wagon and died of brain injuries within the next 24 hours (July 19, 1899). Dietrich Humbke died with no will and his wife (Louisa) was made the Executor on Oct. 4, 1899. At the time of his death his surviving children were Ernst Sr. 31 yrs, Sophia (Conradi) 29 yrs, Minnie (Callies) 24 yrs, Mary 21 yrs, Diedrich 17 yrs, Alvina 14 yrs & Emma 9 yrs. Chattle Property included 4 horses two of which were called Jerry and Prince; 6 cows of which two were called Sarah and Noudles; 20 pigs; 1 lamb, various equipment & wagons. One can only assume the Humbke family was grief stricken at losing their patriarch. Life continued and it was decided that Ernst Sr. would make a trip to Alberta, Canada in the summer of 1900. He would be looking for homesteads where the family could once more start a new life. Rumor has it that Ernst Sr. joined up with an Indian Band East of Edmonton, Alberta and went South to the Battle River Valley where he found suitable homesteads available. 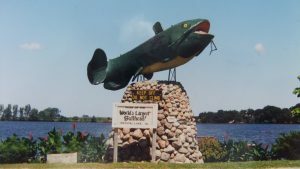 He returned to Woden and in March of 1901 with his mother, Louise, brother Dietrich, sisters Mary Alvina and Emma, plus Carl & Minnie Callies with their 2 year old son (Herman) left Woden for Wetaskiwin, Alberta, Canada. The next 2 blogs will be about Ernest Sr.’s life in Iowa; and Henrich and Sophia Conradi. Please point out any spelling mistakes or other errors in order that I may correct them. I have edited the first 3 blogs once again in an attempt to correct grammar and factual mistakes. My biggest challenge is to make the photos as clear as possible and all documents readable. Please assist me by way of suggestions. Right now I am taking photos of photos and documents and uploading them to this site in digital form. Perhaps I need a better camera! The general layout on my desk monitor looks not too bad, but I am scared to look at what appears on an iphone. I understand that is very quickly becoming the main way individuals access the internet. Any suggestions? Another challenge I need help with is research. My personal knowledge of Carl & Minnie Callies and their descendents is very limited. All I have is a document showing that Ernest Sr. and Carl jointly signed a $2,000 bond guaranteeing that Louisa would carry out her duties as executor of the estate, before she could leave Iowa. If you are a Callies please call me at 780-782-6277 or email me at rogerhumbke@hotmail.com.